A keeil is an early Christian chapel dating from before the introduction of the parochial system in the 12th century. In the sixth century there emerged a class of clergy, independent of the monasteries, who lived a solitary and austere life. These recluses known as Culdee's (from Cele De servant of God) from the 8th Century would build his own cell or oratory ('Keeill') and act as spiritual father to the local families. Earliest keeils were probably mud and wattle (long disappeared) whilst those that remain as ruins generally have earth walls lined inside with stone. These probably date from 8th to 12th century and typically measure 5m by 3m. Keeills is the standing term for the primitive chapels which once were scattered all over Man to a number of more than 200. The survey (p. 32I ff.) goes to show that about 160 such treen-chapels are known at present in the Isle. Even if no keeill now remains intact and as a rule only the foundations are left, one is able to form an idea of their original appearance. They were built of unhewn stones, slabs, earth and rubble, in ancient times, with no other kind of agglutinate than earth or clay, later, shell mortar or cement. The size varies vary considerably. The Ballachrink-keeill in Marown measures only 10' x 6' inside. Otherwise they may attain 23' x 13' (Keeill Vian, Lonan), even 57' x 18' (St; Patrick's Chapel, Patrick's Isle), and 75' x 24' (St. Trinian's, Marown). The walls vary in thickness from 2' 4" to 4' 8" and are, on the outside, protected by an embankment of earth and stones, in height 2'-5', in depth 4'-10'. The shape is rectangular with no division between nave and chancel. The door which is narrow and tapering towards the top, is usually situated in the western gable. The windowas a rule only oneis built at a height of 2'-3' above the floor. The altar is invariably placed against the eastern wall, attaining a height of about 2'. 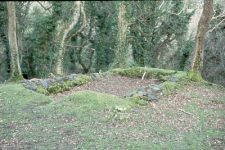 Usually the keeill was built upon a natural or artificial elevation in the terrain and had attached to it a burial ground, surrounded by a mound, which in height could reach 5'-6'. The whole plan of the keeill recalls, on a small scale, a rath or a liss, upon which it was certainly modelled. shows the site of St Bridget's keeill, Eyreton, close to the Millenium way above Crosby. 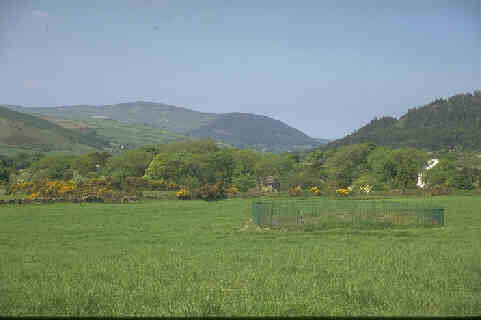 The following list of the better preserved sites is taken from "The Ancient and Historic Monuments of the Isle of Man"
The trees are on the edge of a steep gully in which runs the small river; Spooyt Vane waterfall is about 100m to right. Around the keeil site is a raised bank. A list of Keeil sites in each parish is given by Kermode - Keeils and their names are currently a topic under investigation and the old argument of a keeil/treen may now longer be a simple as first thought - I hope to considerably expand this topic in future pages.